I'm going to be honest, up front. This is a different (and longer) post than I typically write. In fact, if I'm being really honest, I don't really write many posts anymore. I started this blog when I relaunched my website several years ago, but have mostly abandoned it since then. Such is life when you're a dad, you work full time during the week, and are a popular, local balloon twister and magician on the weekends. Some things just have to take a back seat. And, I guess I should also say that I wasn't sure I should share this here, on a blog that has been, until now, entirely for the purposes of marketing myself as a magician and a balloon artist. This is going to be a much more personal post. And possibly a controversial one. The old axiom that "all publicity is good publicity" isn't always true. But, as I've thought more about this, I've made the decision that I believe everything I'm going to say, and I'm willing to stand by it, no matter what. ​As an entertainer and a creative professional, I get asked to work for free. A lot. Like, a real lot. So often, in fact, that I have a very standard reply ready to go when a charity asks me. Because, to be clear, about 95% of the time it is a charity or non-profit event asking. Sometimes it's an animal rescue. Sometimes it's for research for a disease. And sometimes it's just a mom trying to raise awareness for a rare genetic disorder her child suffers from. In almost every instance, I decline. Please don't think I'm heartless, though. I actually do quite a bit of volunteer work, even though I don't really talk about it much. I've been humbled by the work I've done for organizations like The Make-a-Wish Foundation, The Ronald McDonald House, and other non-profits that do so much for children and members of my community. Later this year I'll be volunteering for Supper With Santa, a fundraiser for a mom in my community who recently lost her six year old daughter. But, as heart breaking as it is for me - a father of two beautiful girls - to say 'no' to a mom trying raise awareness for a genetic disorder her child is living with, the simple fact is that I can't say yes to all of them, especially when they fall on a weekend. I'm not a big business. I'm just one guy, and the vast majority of the work I get comes on the weekend. Still, I don't mind them asking. I get it. It's a numbers game, and maybe theirs is the one that I'll choose to say 'yes' to this time. This is different, however, from the other 5% of the time when I get asked to work for free. In those instances, I'm being asked by for-profit companies. Always companies much larger than mine. Almost always large, national brands. Sometimes these requests come with a thin veil of "charitable" work. "Won't you please volunteer for our 'give back' night?" This is another way of saying, "won't you subsidize our charitable giving?" However - in some instances, these large companies dispense with even the pretense of helping others and simply ask for me to work for free because. Because what? Who knows, although usually there's an offer of "exposure." This is no surprise to creative professionals. We deal with this all the time. Whether it's a graphic designer, a writer, or even a balloon artist, some people value our work only until they are asked to pay for it. Actor/Writer Wil Wheaton set off a flurry of conversation on this topic last year when he tweeted and subsequently blogged about it. A British grocery chain found itself in hot water when they tried to find an artist to work for free. 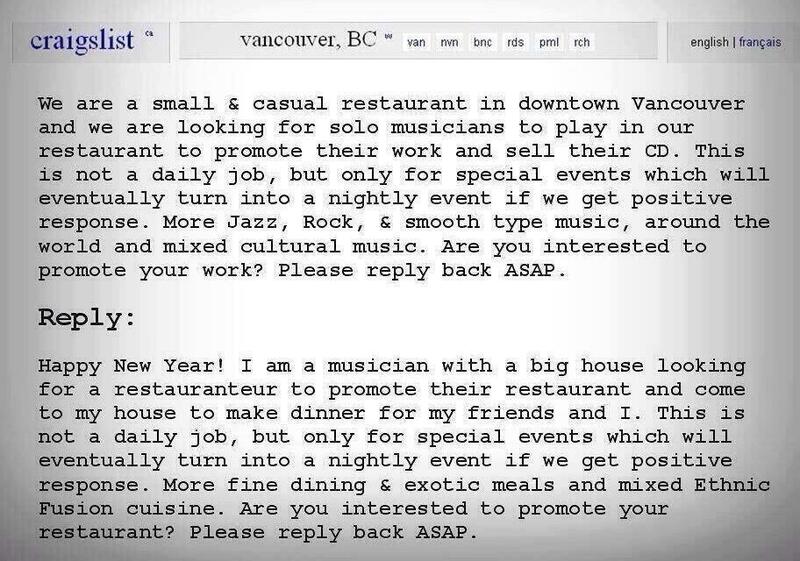 And some clever person hilariously answered a Craig's List ad looking for a free band. But still, it annoys me. And today I experienced perhaps the most annoying and offensive conversation on this topic that I've had. I'm going to share it below with only minor edits to protect the identity of the e-mailer (I'm not trying to name and shame here, I just want to bring a little bit of awareness to the issue). The one bit of context I want to provide is that this e-mail comes from a Fortune 500 company. Specifically, a company that sells high end items in its field. Think BMW or Apple. It's not either of those companies, but that's the kind of company this is. And they are writing about an event to celebrate a collaboration with another Fortune 500 company that controls a major, world wide brand. [Our Company] is hosting an event [on an upcoming Saturday] for the launch of our new partnership with [another Fortune 500 company]. We want to make this kid friendly and we are looking for a balloon artist to be apart of our event. We were hoping you might be interested in donating your time and talent to this event. We do have a small stipend to help cover the cost of your balloons. In return you will be able to advertise your business at our event and we will also post your business information on our social media pages. Feel free to contact me if you have any questions, we look forward to hearing from you. If you'd like to book me for this event, please let me know. Thanks for getting back to me so quickly. All though we would love to work with you. We are looking to partner with someone for this event. When we found your website (which is awesome by the way) we did visit your Facebook page. We noticed that you have monthly get togethers with oether balloon artist. Do you know if anyone in your group, is new to the party industry and who would be interested in partnering with us to get their name out in the community? Any help you could give us we greatly appreicate! I believe she's referring to this Facebook post, but I digress. Below is my response, offered with no further comment. I'm going to assume that your request is an honest, good faith attempt at finding a local artist to work with in a mutually beneficial way. And I'm sure that you, personally, are a really nice person who is just trying to do a good job for the company you work for. But for the sake of sharing my perspective and hopefully helping you see things in a new way, I want you to understand that what you are asking for is incredibly insulting. You represent a Fortune 500 company holding an event to celebrate your business partnership with another Fortune 500 company, and you're trying to find a starving artist willing to help make your event better by working for free. You probably don't know this because you aren't an artist or in any artistic communities, but the idea of artists being asked to work for free (or for "exposure") is so prevalent (and so maligned) that, in just a minute or so of Googling, I was able to pull up these examples to share with you. There are so, so many more. Just google "exposure memes" and you can spend an entire afternoon reading all the ways people have found to express the never ending frustration of having their profession not taken seriously. By even asking for free work for your for-profit event you are opening your company (and your new partner) up to these kinds of headlines. All to save a few hundred dollars. The other thing I want you to understand is that you're not offering anything of value in return. The notion that anyone will get business by being shared on your Facebook page is misguided. Your page has [less than 200] fans. I know a little bit about Facebook; that probably means your posts reach about 4 or 5 people through natural engagement. An advertising campaign that isn't targeted would need to reach thousands and thousands of people to be effective. And the promise of "advertising" at the event is basically to say that an artist can hand out business cards, right? Well, no balloon artist has a hard time finding somewhere to work for free and hand out business cards. I could walk in to any store at the mall and offer to provide their guests with free balloons in exchange for handing out my cards and find a store proprietor overjoyed at his luck. Look - I understand that, while your company certainly can afford it, it may not want to spend the money to hire a balloon twister for this event. I'm a business owner, too (albeit a much, much smaller business), so I understand the need to be careful about how you spend your marketing budget. But if you don't want to pay for a balloon twister, that means you don't get to have one. I really do wish you luck with your event, but I hope that in the future you'll only ask artists to work for you if you are willing to pay for their services. I absolutely LOVED that final response. Direct and to the point, but in a professional manner. Something I many times lose site of as I "rant" to the person on the other end of the line. Candid, yet tactful and professional. I'm saving this post as a guide in writing such responses in the future.